Bavalt joined on Apr 27th, 2010, since that has made 68 posts that are still accessible today, 0 of which are threads. Helping shape the community, Bavalt has given 72 upvotes, and was last online on Feb 26th, 2019. It stuck with me for its weirdness, and now I use it as a BGM when working on something. I think it stops counting as a romance plot once the relationship is actually established. Picked this up today on a whim at the bookstore when I saw Nisioisin's name on it, and it blew me away. The premise is as follows: the protagonist, a college-age aspiring author, witnesses a tragic accident one day, and in particular, witnesses a young girl involved in the accident reacting in a way that shakes him. As he's trying to process this, a small series of events ends with the same girl sneaking into his house and abducting him at knifepoint, bringing him to her house and locking him in a closet. This leaves him wondering not only how to escape, but what his bizarre captor's motives are. I bought this for the name, and I got what I paid for. This is unmistakably a Nisioisin story, with his typical introverted, self-monologuing type of protagonist, a co-lead that seems almost alien but ultimately makes perfect sense, and a meaty (if short) plot supported by a strong thematic core made very explicit. 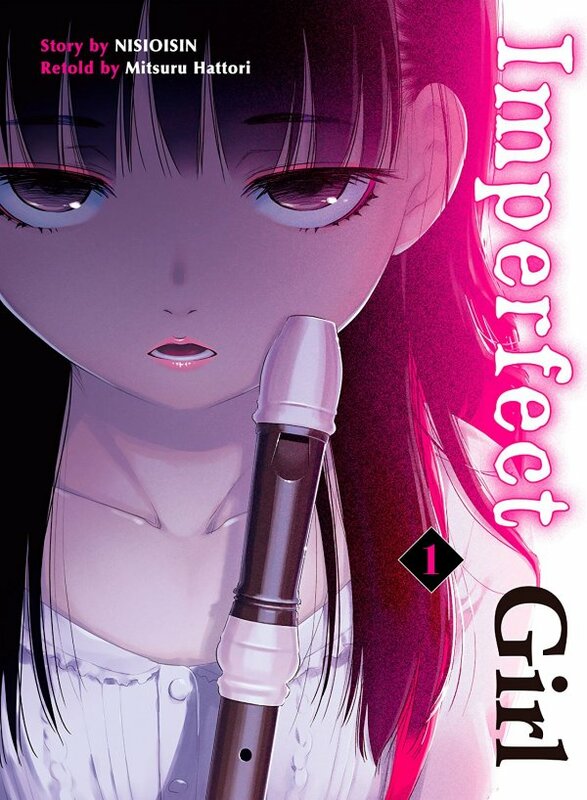 If you like Nisio's work, you'll like Imperfect Girl, and if you haven't seen or read any of his other stuff, I'd call this an almost ideal jumping-off point. It's equal parts suspenseful, comical and poignant, and short enough to be read in an hour or two. I came away from this manga deeply impressed, and even inspired a little. The climax hit me really hard, and I think the theme culminates in a way that's bound to speak to most people in the modern world, particularly those in or around their 20s. In short, I was impressed enough to dredge up a manga recommendation thread to talk about it. Imperfect Girl comes highly recommended. I've got two main points here. First, people cosplay for different reasons, and while I don't think there's anything wrong with appreciating cosplay that's particularly true to the source (because of course there isn't - that takes skill and effort to pull off even IF you've got the right body for it), that's not the only "point" to cosplay. Plenty of people just want to express that they like or relate to a certain character, or use it as a way to start conversations with fellow fans, or just want to wear something out of the ordinary. I don't think any of those are wrong ways to participate in cosplay, and none of them demand that the portrayal be as accurate as possible. If you like being a purist, cool. Compliment those cosplayers who you feel have done a great job portraying their character. But it's shortsighted to assume that everyone in cosplay is doing it with that as their goal, and going around telling people their facial structure isn't similar enough is gonna get you some weird looks. Second, anime is abstraction, and abstraction is a powerful thing. Ignoring the (rather large, actually) stylistic variations across anime, anime characters all look like anime characters regardless of the setting they appear in. A Japanese character in an anime set in Japan will look the same as a Western character in an anime set in the west, will look the same as a character of the point-of-view culture in an anime set in a completely fictional world. Filtering a character through abstraction is a great way to make that character appeal more broadly - the audience by default isn't given some of the cosmetic information that might alienate them. Animation has the unique advantage over live-action of being able to present a character without a race if it wants to, and ignore that potential hurdle in a viewer's association with the characters. Departures from that style can even be used to give visual cues as to how race is perceived from the point of view of the protagonist, even in such a way that circumvents the viewer's own real-life perspective. Many anime set in Japan have western characters drawn in a different style, but the same is true vice-versa. You could feasibly set an anime in Africa, use the default anime style for the protagonists, and portray characters from regions further north with literal white skin, and it would still make sense. Attributing a single race to the anime style isn't reasonable when there are plenty of counterexamples right there in the medium. Anime is race-fluid: ethnic depiction is entirely up to the particular anime. The same rule (specifically, the lack of any universal rule) ought to extend to cosplay too. Also racism and overall meanness, but I think that argument more or less speaks for itself. tl;dr Nah. Don't ruin cosplay for people. Started a manga last night, and now I'm six volumes in and nearing the conclusion, only to find out that I need to wait for the last one to release. I was really enjoying it! Kawaisou strikes a great balance - it's hilarious, but also has a lot of heart (and an OP by fhana, so, y'know, bonus points.) I'm in agreement that it didn't get as much attention as it deserved while it was airing. Wish it'd been successful enough to merit more seasons. Watch Planet With. Satoshi Mizukami is an incredibly talented writer, and while I wouldn't (thus far) put his first anime on par with the likes of The Lucifer and Biscuit Hammer or Spirit Circle, it's still a joy to see his zany ideas in motion, and the themes, while not subtle, are juicy and well-considered. I honestly don't know if the community at large has picked up on how good this show is yet, but I'm not gonna pass up a chance to plug it. I want to toss up a recommendation for Planet With. I've been a big fan of Satoshi Mizukami since I read Spirit Circle, and now that he's finally doing an anime, I'm stoked. This guy's amazing at taking bizarre or downright silly concepts and weaving them into poignant and compelling stories, and the first episode just oozes with his style. The level of strangeness might not be for everyone, but if you like a bit of absurdity, I implore you to check this out. Put my pants in the wash with my most recent pay still in the pocket. Most of it was plastered to the sides of the washing machine, but there's about $40 unaccounted for.